At centre is three diagrams used to signal three stages: before diagnosis, after diagnosis, and recovery. But, this is a very different idea of recovery – a process of learning, growing, of trial-and-error, and transformation. She tells how she remembers clearly a key moment when she was being told by a babbling doctor how she was now an illness. In instinctively rejecting this imposition of identity she found a resolve and an idea for a different story for her life than the one the doctor was prescribing for her, one of finding her power, learning to take charge of her own life, and fixing mental health services so people would not need experience what she had. She also tells of how even with that resolve and energy and with the powerful sense of change she now felt inside, it would take some time for others to be able to notice – there would be many more months of “coke-and-smoke syndrome” before she would one day took up her grandmother’s invitation that she made daily with great patience and joined her shopping. That first step led in time to more small steps, exploring, finding what works for her, developing strategies for living and especially for living with vulnerabilities that she could learn to recognise were part of her, part of her life. As she did she noticed in time how some of the experiences that would hitherto have given rise to her having great difficulty no longer would. She had grown, learned, was growing, learning. Becoming confident in deciding for herself what she needed, and how to turn her dream into reality, all part of becoming a full person. As she says this is quiet different from the story that services prefer we fall in with so they can tell themselves the story that they are doing a good job. Recovery is intensely personal. and it is bloody difficult. Nobody can give it to you and nobody can tell you what yours is. For Pat and many others it’s about self-directed, interdependent full person able to make own life our way transformation far from going back to make like a lamppost, but about embarking on a journey into the unknown and becoming who we can be. The article rounds off with some suggestions of how workers and services can play their role in supporting people as they make their self-directed journey of transformation. No amount of rebranding and slogans and swag can bring about the kind of real systems change that so many can see we need in mental health services. “Recovery is often defined conservatively as returning to a stable baseline or former level of functioning. However many people, including myself, have experienced recovery as a transformative process in which the old self is gradually let go of and a new sense of self-emerges. In this paper, I will share my personal experience of recovery as a self-directed process of healing and transformation and offer some suggestions as to how professionals can support the recovery process. First of three stages in which Pat Deegan uses the imagery of a flower with petals to tells her story of how the way she was perceived by others, and how she saw herself in three stages: before, then after diagnosis and then in her recovery-transformation. A journey of promise then of finding herself struggling, others taking control and deeming her “ill”, ceding identity to an illness, being given a prophesy of doom, than rejecting that prophesy and within that finding energy and resolve to begin finding her way to becoming – through spirited fight, growth, transformation and emerging as a full person- as Pat. 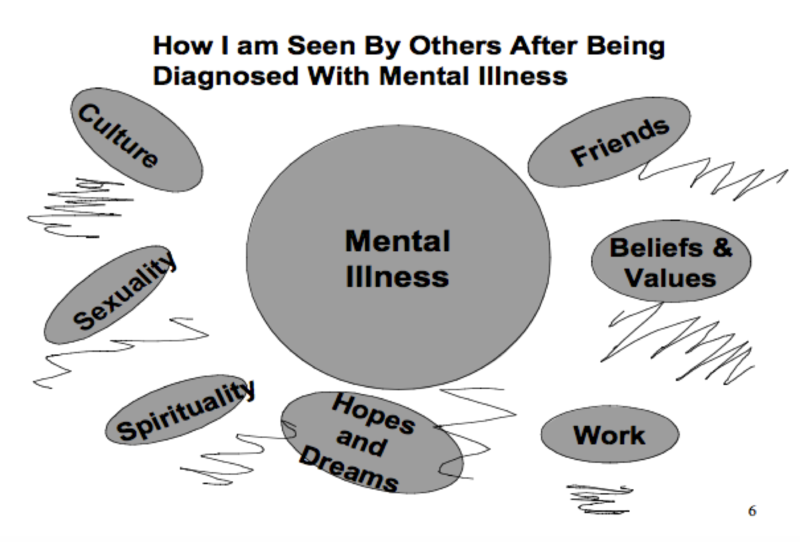 “The illustration below symbolizes how I experienced myself and how others perceived me, before I was diagnosed with schizophrenia. “The most immediate impression of this symbolic flower is its integrity and wholeness. This represents the fact that before being diagnosed with mental illness there was a basic congruity between how I understood myself and how others perceived me. “I was the oldest child in a large working-class Irish Catholic family. My friends, my social role as a worker and student, my spirituality, values and beliefs, culture, family and socio-economic class all converged to form the unique individual I was at seventeen years old. “It was precisely because my future was unknown that I could project my hopes, dreams and aspirations into it. That is, hope arises in relation to an open, ambiguous and uncertain future. “The image of me as a whole, unique and promising young person began to crumble during the winter of my seventeenth year. Even now I can vividly recall some aspects of the emotional distress I began to experience. “For instance, during basketball practice it became harder and harder to catch a ball. My depth perception and coordination seemed strangely impaired and I found myself being hit in the head with passes rather than catching the ball. Objects around me also began to look very different. Countertops, chairs and tables had a threatening, ominous physiognomy. Everything was thrown into a sharp, angular and frightening geometry. The sense that things had utilitarian value escaped me. For instance, a table was no longer something to rest objects upon. Instead a table became a series of right angles pointing at me in a threatening way. “A similar shift in my perception and understanding occurred when people spoke to me. Language became hard to understand. Gradually I could not understand what people were saying at all. “Instead of focusing on words, I focused on the mechanical ways that mouths moved and the way that screwdrivers had taken the place of proper teeth. It became difficult to believe that people were really who they said they were. “What I remember most was the extraordinary fear that kept me awake for days and the terrible conviction I was being killed and needed to defend myself. “The adults around me eventually decided that I had “gone crazy,” and I soon found myself being escorted up a hospital elevator by two men in white uniforms. Once in the mental hospital, I was diagnosed with schizophrenia. “Whereas before being diagnosed I was seen as a whole person, after being diagnosed it was as if professionals put on a pair of distorted glasses through which they viewed me as fundamentally ill and broken. it was as if professionals put on a pair of distorted glasses through which they viewed me as fundamentally ill and broken. “The jagged lines represent the distorted lens through which I was viewed. It seemed that everything I did was interpreted through the lens of psychopathology. It seemed that everything I did was interpreted through the lens of psychopathology. “For instance, when growing up my grandmother used to say I had ants-in-my-pants. Now, in a mental hospital, I was agitated. “I never cried very much while growing up, but after diagnosis I was told I had flat affect. “I was always quiet, shy, and introverted. Now I was guarded, suspicious and had autistic features. “And in a classic double-bind, if I protested these pathologized interpretations of myself then that was further proof because I lacked insight! “Notice also in the first illustration there was congruity between how I viewed myself and how others viewed me but after being diagnosed there was a lack of congruity. 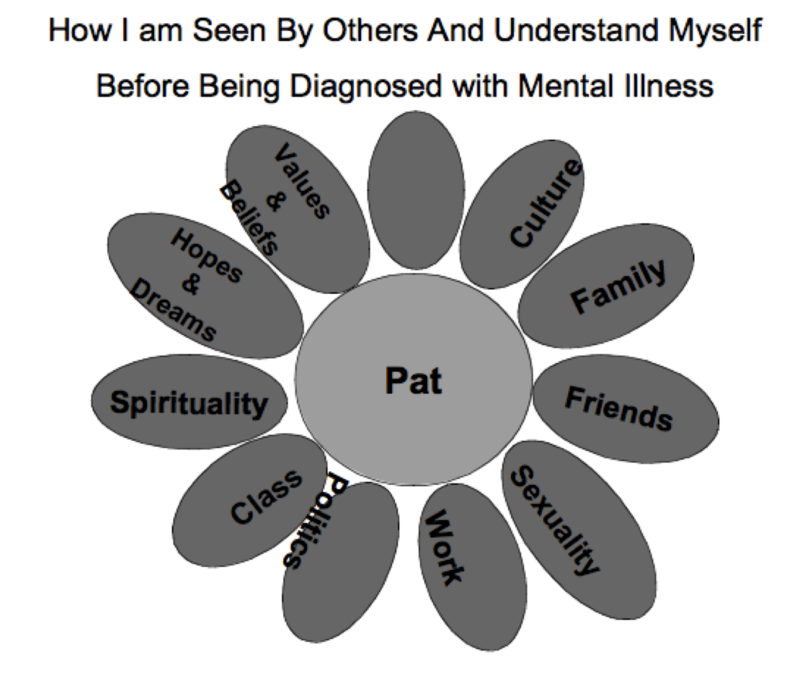 That is, although I was severely distressed, I still felt that deep down I was myself – Pat. “However, the professionals and later my family and friends, seemed to forget about Pat and were now more interested in “the schizophrenic”. “This is symbolized by the substitution of a diagnosis for my name in the center circle. “What mattered most to psychiatrists, social workers, nurses, psychologists and occupational therapists was that I was “a schizophrenic”. My identity had been reduced to an illness in the eyes of those who worked with me. My identity had been reduced to an illness in the eyes of those who worked with me. “It was only a matter of time before I began to internalize this stigmatized and dehumanized view of myself. When we diagnose, we objectify and dehumanize : we set a person apart from us, apart from humanity. We deny and remove their persnhood, reduce them to “it”. This is an act of violence. “Dehumanization is an act of violence, and treating people as if they were illnesses is dehumanizing. Everyone loses when this happens. Dehumanization is an act of violence, and treating people as if they were illnesses is dehumanizing. Everyone loses when this happens. “People, especially people who are feeling very vulnerable, internalize what professionals tell them. People learn to say what professionals say; “I am a schizophrenic, a bi-polar, a borderline, etc.”. “Yet instead of weeping at such a capitulation of personhood, most professionals applaud these rote utterances as “insight”. 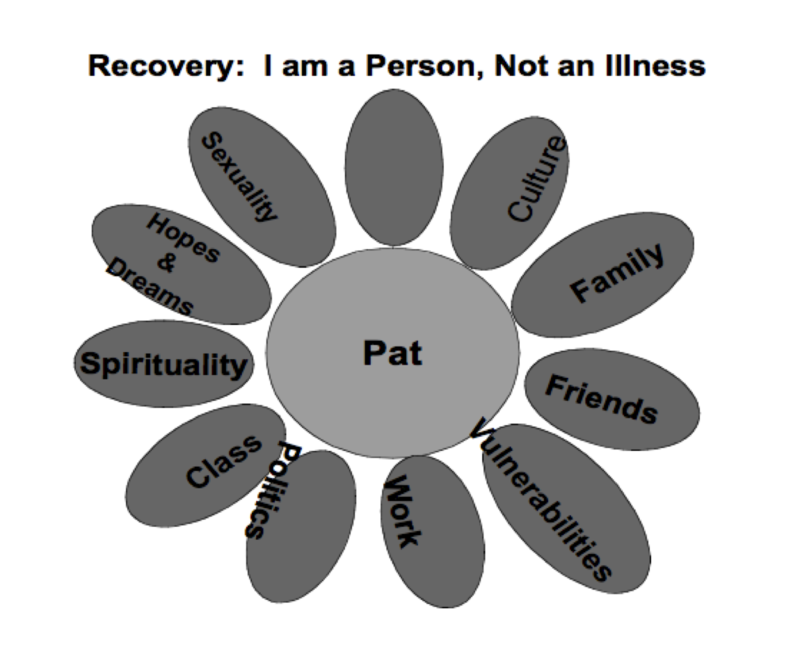 Of course the great danger of reducing a person to an illness is that there is no one left to do the work of recovery. “Notice that the empty petal is missing from Illustration 2. This symbolizes the fact that because of my diagnosis professionals lost hope that I could have a meaningful future. “Coping is definitely not what a teenager wants to do on a Friday night! I was not at all inspired by the thought of a life spent coping. I remember feeling like I had been hit by a truck upon hearing his words. Coping is definitely not what a teenager wants to do on a Friday night! On how the energy she felt from her survival instinct – her rejection of the doom prophesy generated the determination to follow the dream of who she could become, and the role and place she could make in the world. “I remember feeling like I had been hit by a truck upon hearing his words. “Today I understand that this psychiatrist did not give me a diagnosis. He gave me a prognosis of doom. Today I understand that this psychiatrist did not give me a diagnosis. He gave me a prognosis of doom. “Essentially this psychiatrist was telling me that by virtue of the diagnosis of schizophrenia, my future was fait accompli. He was telling me the best I could hope for was to cope and remain on medications for the rest of my life. “He was saying my life did not open upon a future that was ambiguous and unknown. He was saying my future was sealed and the book of my life had already been written nearly 100 years earlier by Emil Kraepelin (1912), the psychiatrist who wrote a pessimistic account of schizophrenia that influences psychiatrists even to this day. According to Kraepelin my life, like the life of all schizophrenics, would be a chronic deteriorating course ending in dementia (Kruger 2000). “With the wisdom of hindsight, I understand why this moment in the psychiatrist’s office was a major turning point in my recovery process. “Importantly, it was my anger that announced the resurrection of my dignity after it had been so battered down during hospitalizations. My angry indignation was a sign I was alive and well and resilient and intent on fighting for a life that had meaning and hope. “What some would have seen as denial and a lack of insight into my illness, I experienced as a turning point in my recovery process. Rejecting the hopeless prognosis through angry indignation happened almost like a reflex. “And just as quickly as I turned away from the prophecy of doom, I found myself asking – so now what? In other words, I turned away from a hopeless path but also, at the same time, had to turn toward something. “What I remember was that when I left the psychiatrist’s office, I stood in the hallway and had an image in my mind’s eye of a big heavy key chain – the type carried by the most important and powerful professionals who have the keys to all the hospital doors. I found myself thinking, “I’ll become Dr. Deegan and I’ll make the mental health system work the right way so no one else ever gets hurt in it again.” And this plan became what I have come to call my survivor’s mission. “Yes, it was a grand dream that would have to be molded and modified with time and maturity. But it was my dream nonetheless and it became the project around which I organized my recovery. I did not tell anyone about my dream. In hindsight, this was very wise. “I wish I could say that having found a survivor’s mission I resolutely marched forward in my recovery. But recovery does not strike like a bolt of lightening wherein one is suddenly and miraculously cured. recovery does not strike like a bolt of lightening wherein one is suddenly and miraculously cured. Though Pat was herself now able to sense a great shift within and begin to see the possibility of a different future than the one she was being offered, it was yet to translate to changes others might notice in her behaviour. “The truth is, when I returned home after that transformative experience, I proceeded to sit and chain smoke in the same chair I had been sitting and smoking in for months. In other words, although everything had changed within me, nothing had changed on the outside yet. She forces herself out of bed at 8 o’clock in the morning. In a drugged haze she sits in a chair, the same chair every day. Cigarettes mark the passing of time. Cigarettes are proof that time is passing and that fact, at least, is a relief. From 9 a.m. to noon she sits and smokes and stares. At 1 p.m. she goes back to 10 bed to sleep until 3 p.m.
At that time she returns to the chair and sits and smokes and stares. She returns to the chair at 6 p.m. Finally, it is 8 o’clock in the evening, the long-awaited hour, the time to go back to bed and to collapse into a drugged and dreamless sleep. “For for many months, I would live in what I came to call the coke and smoke syndrome. For many months I would live in what I came to call the coke and smoke syndrome. “The first truly proactive step I took in my recovery process occurred at the prompting of my grandmother. “Each day she would come into the living room as I smoked cigarettes. “She would ask me if I would like to go food shopping with her and each day I would say “No”. “She asked only once a day and that made it feel like a real invitation rather than nagging. “For reasons I cannot account for, one day, after months of sitting and smoking, I said “Yes” to her invitation. I now understand that “yes” and the subsequent trip to the market where I would only push the cart, was the first active step I took in my recovery. Other small steps followed such as making an effort to talk to a friend who had come to visit or going for a short walk. “Eventually it was suggested I take a course in English Composition at the local community college and I agreed. Going to college presented me with a whole new set of challenges such as managing anxiety, distressing voices and suspicions during class time as well as finding ways to concentrate in order to do homework. At the time there were no organized self-help and mutual support groups for ex-patients so I was very much on my own in terms of developing coping strategies. “Through a process of trial and error, I discovered self-care strategies that worked for me. “For instance, I learned at a young age that street drugs, alcohol and even some over-the counter drugs such as certain types of cold medications were not good for me. I avoided these and am certain this helped my recovery. “Relationships – especially learning to balance time alone and time with people – have always been an important self-care strategy for me. In the beginning, my relationships were quite limited and lopsided in the sense that people tended to care more for me than I did for them. Over time I learned to become more intimate with people and to develop more mutually reciprocal relationships. “Routines were important to me, especially in the early years of my recovery. Sometimes when everything was falling apart inside of me, it was good to be able to rely on routines that would give form and structure to the chaos I was experiencing. “Having a sense of purpose, a reason to get up in the morning and a goal to organize my recovery around were important. Studying a wide range of subjects, especially world religions, philosophy and archetypal psychology were helpful in my efforts to make sense of the experiences I was having. “My spirituality offered me a way of finding meaning in my suffering and that in turn helped me through feelings of anguished futility, self-pity and the inevitable “why me” questions that come with difficult passages. “Tolerant environments have always been helpful in my recovery. I discovered this quite accidentally when I moved from a single rented room, into an apartment I shared with a group of ex-hippies. In that environment, my roommates were quite open to all sorts of unusual experiences and their world-view included experiences like auras, astral travel, etc. In such a tolerant atmosphere my psychotic experiences were not viewed as terribly deviant and nobody overreacted. In such a tolerant atmosphere my psychotic experiences were not viewed as terribly deviant and nobody overreacted. Instead, people were non-intrusive, generally kind and supportive, and they gave me the room I needed to experience my madness. In this tolerant environment I learned that although psychosis does not come with directional signs and maps, it does have a certain terrain and topography. I found that if one returns to the psychotic landscape over time, one can come to know it, to learn not to fear it, and to master ways to navigate through it. I found that if one returns to the psychotic landscape over time, one can come to know it, to learn not to fear it, and to master ways to navigate through it. “Learning to tolerate discomfort, anxiety and symptoms meant developing a new relationship to time. I can remember trying to make it through a one hour class and sometimes watching the clock, repeating to myself, “I can make it just one more minute.” Each success built my sense of self-efficacy and confidence in my skills to endure and persevere. “I learned to tell myself “tomorrow will come”. This phrase took on great significance for me in my recovery. Tomorrow will come meant that if today was too painful, it too would pass. “I did not find psychiatric drugs to be particularly helpful except for their capacity to help me sleep during very stressful times. I found the emotional numbing, sexual dysfunction, and overall sluggishness caused by the drugs to be more disabling at times than psychotic symptoms. The key for me was learning to use medications in conjunction with self-help strategies and overall self-care practices. The more skilled I became in using self-help, the less I relied on medications. The key for me was learning to use medications in conjunction with self-help strategies and overall self-care practices. The more skilled I became in using self-help, the less I relied on medications. This work needed to come later because as she explains she needed to be able to feel grounded and confident in her abilities to work through what would come up, and be able to be ok.
“Later in my recovery, I became willing to do psychotherapy in order to work through a history of child abuse. 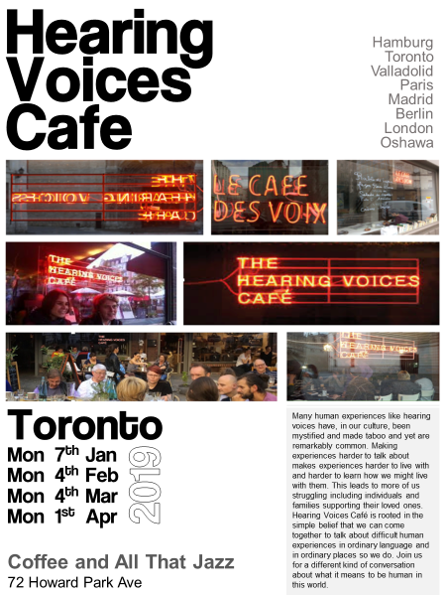 This was long and difficult work and I am glad I embarked on it after I had established myself in a meaningful career and had a strong network of friends. I needed to be firmly planted in the present as an adult, in order to look back at the trauma in my childhood. 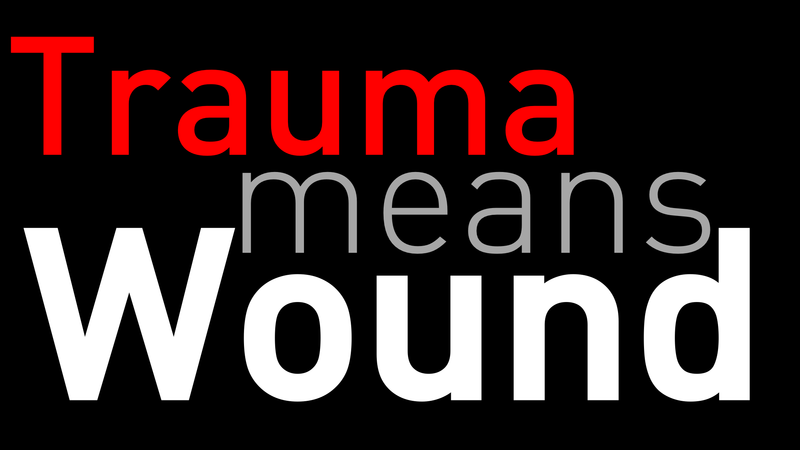 In the course of doing the trauma work. I sought out the help of an occupational therapist who specialized in sensory defensiveness in adults. She helped me learn a myriad of coping strategies including use of a sand blanket, joint compression, tactile brushing, and the use of a sensory diet to help me modulate sensory input and affective arousal. These strategies have proved tremendously helpful and are a part of my everyday recovery “toolkit”. Shares some of the strategies she developed and that she found work for her. “I developed many self-help strategies that made it possible to cope with a myriad of symptoms. For instance, I learned to use headphones and earplugs to stop the distressing voices I heard. I learned to avoid certain types of situations and subjects that would lead me into the vortex of delusional thinking. “Physical exercise, especially daily walks in the woods, remain an important self-help strategy for me. “Overall physical health, a good diet, a willingness to pace myself and to get sleep were all important strategies that I learned and refined over time. For me, recovery meant learning to overcome the shame and stigma I had internalized. Like many people in the early stages of recovery, I saw becoming normal as a goal. For me, recovery meant learning to overcome the shame and stigma I had internalized. Like many people in the early stages of recovery, I saw becoming normal as a goal. “I remember going through a phase where I measured my wellness by how little medication I took and how few mental patients I was associated with. In fact, there was a time when I refused to be around people with psychiatric histories. I thought the further I could get away from them, the further I could distance myself from my own history. For many years I settled for simply “passing” as a normal person. Pressure – from within, to stay away from others who were struggling in similar ways, to stay quiet, and how that lead to having to deal with everything alone; and the pressure from without, from others. “The pressure to remain in the closet about my psychiatric history did not come just from me. There was a good deal of social pressure to keep my psychiatric history a secret. For instance as a student in graduate school there was the unspoken rule that if you had a psychiatric history there was no way professors would allow you to become a clinical psychologist. “I hid my psychiatric history and that meant reliving many traumatic memories with no support. For instance, I remember doing my first internship in a state hospital and on the first day having a panic attack when the heavy metal door slammed shut behind me. I can remember freezing in a type of flashback when I witnessed a person being dragged into restraints. Only a few years ago that had been me! Living in the closet meant I had to work through this part of my professional development alone. I found living in the closet was the same as living a lie. I grew tired of being ashamed. Living in the closet meant I had to work through this part of my professional development alone. I found living in the closet was the same as living a lie. I grew tired of being ashamed. “By the time I had finished my doctorate I began to meet psychiatric survivors and activists who had recovered. Meeting these friends was an epiphany for me. They taught me it was not my problem the world insisted I be either a clinical psychologist or a mental patient. “It was not my problem people insisted I wear one hat or the other in order to make them comfortable.I was a whole person. I was a person with a psychiatric history who was also a clinical psychologist. If the world did not have a category for that, then that was the world’s problem, not mine. I did not have to live in the closet so others would feel comfortable. There were others like me and if we supported one another, we could lead our lives with pride. “Notice that one new petal has been added to the flower, vulnerabilities. I do not feel I have a residual mental illness that is in remission and that may get activated at some later time. “However, like most people, I live with certain vulnerabilities. I still use my self-care strategies on a daily basis in order to stay well. “I am a person, not an illness. I can use what I have learned through my recovery to continue to lead a whole and vibrant life. I am a person, not an illness. “Recovery has been a process of healing and transformation for me. I am not the same person I was before I went crazy. My madness has been a kind of fire through which I have walked and through which I have been changed. Recovery has been a process of healing and transformation for me. I am not the same person I was before I went crazy. My madness has been a kind of fire through which I have walked and through which I have been changed. There were times in the early years when all I wanted was to go back to who I had been. I wanted to go back to high school and pursue that dream of becoming an athletic coach. I wanted to go back and “feel like myself again”. This wish to return to the former self is understandable and is called a restitution narrative by Frank (1995). “The restitution narrative is a story that some people tell about their recovery. Its basic storyline is: “Yesterday I was healthy, today I am sick, but tomorrow I will be healthy again.” The phrases “good as new” and “I feel like myself again” capture the essence of the restitution narrative. Frank notes that restitution narratives are most often told by people were recently ill and least often by those with long-term conditions. “The restitution narrative does not tell the story of the struggling self, but rather is a testament to the expertise of professionals and their technologies that have “fixed” the problem. This type of narrative is the preferred narrative of the medical professions, as well as the powerful interest groups/industries behind medicine. “The restitution narrative permeates our culture in a myriad of ways. TV advertisements, infomercials, brochures 19 in doctors’ offices, and drug advertisements in magazines, newspapers and professional journals all tell of the restorative wonders of medications. “For instance, in a mainstream psychiatric journal a 1996 advertisement for an anti-depressant drug shows a little girl with a big smile, racing her energetic mom up the stairs in their home. In bright crayon colors, a note from the child reads: “I got my mommy back”. Then comes the name of the drug with the middle letter in bright crayon color. The restitution storyline is clear: Depression came, the medicine worked and then this mom was restored to her family as good as new. “Through the power of such images and advertising, the restitution narrative has become a cultural expectation of how all illness should end happily ever after. Through the power of such images and advertising, the restitution narrative has become a cultural expectation of how all illness should end happily ever after. ‘For those of us who have struggled for years, the restitution storyline does not hold true. For those of us who have struggled for years, the restitution storyline does not hold true. “For us, recovery is not about going back to who we were. It is a process of becoming new. It is a process of discovering our limits but it is also a process of discovering how these limits open upon new possibilities. Transformation rather than restoration becomes our path. Transformation narratives emphasize the agency of the self in the healing process as opposed to crediting professionals with curative powers. “In this light, the task of mental health professionals becomes one of supporting people and helping them build skills and a sense of agency. Helping people learn to become self-directing as opposed to compliant, is a goal of the recovery process. Helping people learn to become self-directing as opposed to compliant, is a goal of the recovery process. “Because recovery is a unique journey for each individual, there is no cookbook approach. Mental health professionals must explore the special gifts and resources of each individual and help them mobilize these resources in the service of recovery. 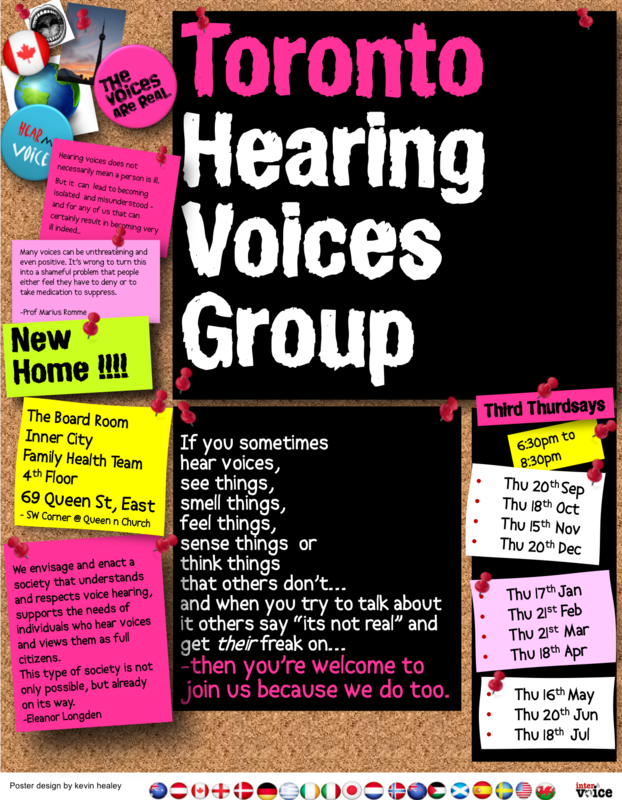 Begin with asking people what they already do to cope with various distressing symptoms. Begin with asking people what they already do to cope with various distressing symptoms. People are more than their diagnoses. People diagnosed with mental illness are resilient and are more than passive victims of disease processes. “Professionals who learn to collaborate with the active, resilient, adaptive self of the client will find themselves collaborating in new and rewarding ways with people who may have been viewed as hopeless by others who reify diagnoses and related prophecies of doom. There is hope for recovery. Each of the seven long-term studies has large cohorts of between 140 – 502 research participants diagnosed with major mental illnesses. The length of study during which the research participants were studied ranged from 22 years – 37 years. The recovery rate in these seven long-term studies ranged from 46% to 68%. That is, half to two-thirds of people diagnosed with major mental illnesses were found to show significant or complete recovery over time. Even in the second or third decade after being diagnosed, people still go on to significant or full recovery. We should never lose hope (Harding and Zahniser 1994). Recovery is not the privilege of a few exceptional clients. Recovery is not the privilege of a few exceptional clients. We can now tell people the good news that empirical data indicate most people do recover. Since there is no way to predict who will or will not recover, we should approach each person as being able to recover if given sufficient opportunity to build skills and supports. We can now tell people the good news that empirical data indicate most people do recover. … we should approach each person as being able to recover if given sufficient opportunity to build skills and supports. In this way, professionals can stop the iatrogenic wounding of hopelessness and begin working with clients on that the transformative journey of recovery. This entry was posted in Abuse, Emancipate yourself..., Ideas, my story, psychosis, recovery perspectives. Bookmark the permalink.